Arrive Bangalore our Representative will meet you and transfer to hotel. Later Go for city sightseeing of Bangalore. Visit the city of Gardens Vidhan Sudha – It houses the State’s Legislature and Secretariat, Nandi Temple - One of Oldest temple, popularly known as the Bull temple. Overnight at Bangalore. Morning Check out from Hotel and drive To Kabini.On Arrival Check into Jungle Resort .Rajiv Gandhi National Park, was earlier known as Nagarhole national park (Kabini), the hunting retreat of the Mysore Maharajas, is definitely the perfect destination for wildlife lovers in South India. The excitement starts with a safari into the heart of the park, where you are sure to spot wild animals in their natural habitat. Some of the popular sightings are elephant, gaur, sambar, chital, wild boar and the more exclusive predators like the tiger and leopard. A bird watcher's paradise, the park is home to over 300 species of birds, many of which are endemic to these jungles. Overnight at Kabini. After breakfast drive to Bandipur. Arrive Bandipur and check in at hotel. Tread the path of the erstwhile Maharaja of Mysore.The reserve is a playground for wildlife, with elephants taking the lead role. Be prepared for an unforgettable experience - you might see a tiger prowling amidst the mix of deciduous, evergreen forest and scrubland vegetation. Set against the picturesque backdrop of the enchanting Niligiri mountains with its mist-covered peaks, Bandipur was once the Mysore Maharaja's private hunting ground. It was brought under Project Tiger in 1973. This is one of the best game sanctuaries in India to observe and photograph wildlife in close proximity. A temple perched atop Himad Gopalaswamy Hill, the highest peak in the Bandipur range, is worth a visit. Overnight at Bandipur. Early morning after breakfast drive to Mysore on the way visit Srirangapatna. The island fortress of the legendary warrior king Tipu Sultan is just 14 km from Mysore city. Inside the fortress is Tipu's mosque with its twin minarets, the Wellesley Bridge and the dungeons where British officers were once imprisoned. Later continue drive to Mysore . On Arrival Check into hotel. Later Visit the famous Mysore Palace. Mysore has been always associated with the royal families and their patronage, be it the Wodeyars or the Sultans. 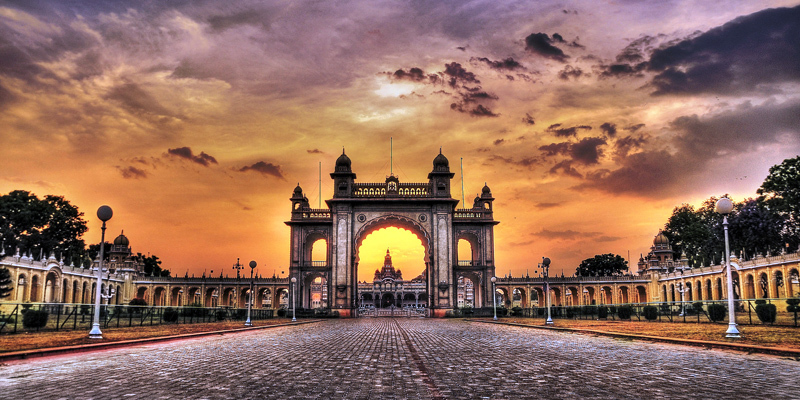 Mysore is a city known for its resplendent palaces and majestic buildings. A visit to the city conjures up visions of the glory, still evident of the illustrious Wodeyar Kings. This former state capital still retains its tradition in music and dance, art, literature and its time-honored crafts. Mysore, once the state capital, today is a vibrant city teeming with tourists and visitors. It is known the world over for its exotic sandalwood and rich silks. Many culinary delights await those inclined to sample the regional cuisine. Overnight at Mysore. Morning after breakfast visit Raganatittu Bird Sanctary, and Later Mysore zoo. Evening Witness the famous Brindavan Gardens .Overnight at Mysore. Early morning after breakfast . Drive to Hassan. Arrival and check into hotel. Later visit to Belur .This quaint hamlet - 38 kms from Hassan - is located on the banks of the river Yagachi. It was once the capital of the Hoysala Empire, today made unforgettable for its exquisite temples. The Chennakeshava Temple is one of the finest examples of Hoysala architecture. It took 103 years to complete and you can see why. The facade of the temple is filled with intricate sculptures and friezes with no portion left blank. Elephants, episodes from the epics, sensuous dancers. they are all there - awe-inspiring in their intricate workmanship. Inside are hand-lathe-turned filigreed pillars. The Veeranarayana Temple and the smaller shrines are well worth a visit. It is 27 kms north-west of Hassan and 17 kms east of Belur. The temples of Halebid - like those of Belur - bearmute testimony to the rich, cultural heritage of Karnataka. The Hoysaleswara Temple, dating back to the 12th century, is astounding for its wealth of sculptural details. The walls of the temple are covered with an endless variety of gods and goddesses, animals, birds and dancing girls. Yet no two facets of the temple are the same. This magnificent temple - guarded by a Nandi Bull - was never completed, despite 86 years of labor. The Jain basadis nearby are equally rich in sculptural detail. Later drive to Shravanabelagola, is an important Jain pilgrim centre. It is home to Asia's largest monolithic statue Lord Gomateswara here towers 58 ft., looming atop the picturesque Vindhyagiri Hill. Every 12 years, Jain pilgrims gather here to participate in a splendid head-anointing ceremony. Overnight at Hassan . Morning drive to Hampi on Arrival check into Hotel . Hampi has been classified as a World Heritage Center and is one of the major tourist destinations in India. If dreams were made out of stone, it would be Hampi. Hampi, the seat of the famed Vijayanagara empire was the capital of the largest empire in post-moghul India, covering several states. The Vijayanagara empire stretched over at least three states -Karnataka, Maharashtra, and Andhra Pradesh. The destruction of Vijayanagar by marauding Moghul invaders was sudden, shocking and absolute. Although in ruins today, this capital city once boasted riches known far beyond the shores of India. The ruins of Hampi of the 14th Century lies scattered in about 26 sq. km area, amidst giant boulders and vegetation. Protected by the tempestuous river Tungabhadra in the north and rocky granite ridges on the other three sides, the ruins silently narrate the story of grandeur splendor and fabulous wealth. The splendid remains of palaces and gateways of the broken city tells a tale of man's infinite talent and power of creativity together with his capacity for senseless destruction. A visit to Hampi is a sojourn into the past. Most of the important structures and ruins are located in two areas, which are generally referred to as the Royal Centre and the Sacred Centre. A visit to Anegundi village by traversing the gushing Tunga Badra river on a coracle is an experience that provides the guests with a glimpse into the traditional country life in Karnataka. Overnight at Hampi. The day at leisure free for your own activites to Explore Hampi. Overnight at Hampi. Early morning drive to Badami. On Arrival Check into hotel Set in beautiful countryside at the foot of a red sandstone ridge, the small rural town of Badami was once the capital of the Chalukyan. Empire covered much of the central Deccan between the 4th centuries AD. Here and at nearby Aihole and Pattadakal, you can see some of the earliest and rock- cut caves. The forms and sculptural work at there sites provided inspiration for the later Hindu empires which rose and fell in the arrival of the Muslims. Though principally promoters of the vedic culture, the Chalukyans were tolerant of all sects, and elements of Shaivism, Vaishnaivism, Jainism and even Buddhism can be found in many of their temples. Badami was the Chalukyan capital from about 540 AD until 757 AD when the Chalukyans were overthrown by the Rashtrakutas. The surrounding hills are dotted with temples, fortifications, carvings and inscriptions dating not just from the Chalukyan period, but from other times when the site was occupied as a fortress. After it fell to the Rashtrakutsa, Badami was occupied successively by the Chalukyans of Kalyan (a separate branch of the western Chalukyan), the Kaachuryas, the Yadavas of Devagiri, the Vijayanagar Empire, the Adil Shahi kings of Bajipur and the Marathas. All these various rulers have left their mark at Badami, and there's even a Pallava inscription dating back to 642 AD when their king, Narasimha Varman I, Briefly overwhelmed the Chalukyans and occupied Badami for 13 years before being driven out. Overnight at Badami. The day at leisure free for your own activites to Explore Badami. Overnight at Badami. Early morning after Breakfast drive to Goa . On Arrival Check into hotel . Goa Also known as "Pearl of the Orient" and a "Tourist Paradise", the state of Goa is located on the western coast of India in the coastal belt known as Konkan. The magnificent scenic beauty and the architectural splendors of its temples, churches and old houses have made Goa a firm favorite with travelers around the world. Overnight at Goa. Morning after breakfast Go for city sightseeing of goar from the slopes of Altinho Hill for a breathtaking view of Panjim and river Mandovi. Then to Dona-Paula for a view of India's largest natural harbour-Mormugao. Afterwards visit old Goa and see the Basillica of Bom Jesus which contains the tomb & mortal remains of St. Francis Xavierh housed in a silver ornate casket , Se. Cathedral- the biggest Church in the East, St. Cajetan- built like St. Peter (Rome), Church of Our Lady Rosary and St. Monica. Overnight at Goa.